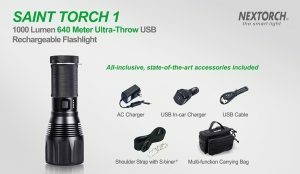 Home / Mobile Lights & Accessories / NexTorch / Flashlights / Nextorch Saint 1, 1000 Lumens Rechargeable Torch. 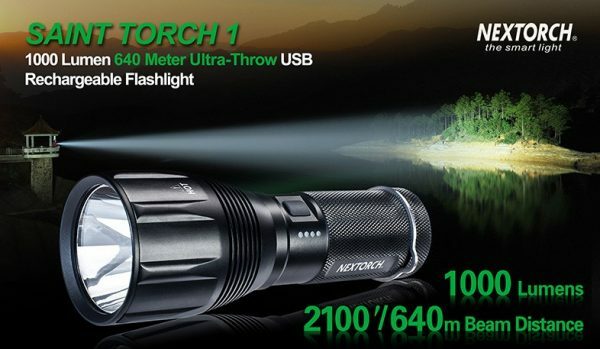 Nextorch Saint 1, 1000 Lumens Rechargeable Torch. Welcome to the Nextorch generation. This torch is SERIOUSLY bright. Rated at 1000 Lumens the Nextorch Saint 1 is a monster. Ok so its not small, in fact its quite large (check the Video at the bottom to see it in action) However the large see is directly proportionate to the large output. 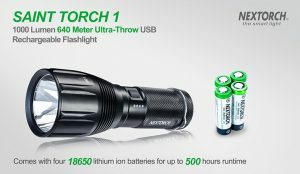 It comes with 4x Rechargeable 18650 batteries. It comes with all the cables for charging. 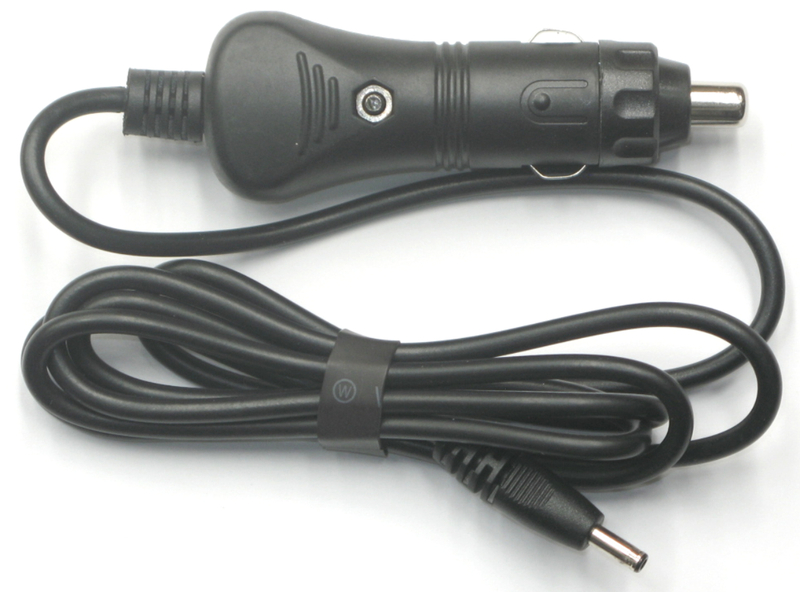 You can charge the Saint 1 on the go in your car with the supplied cables. 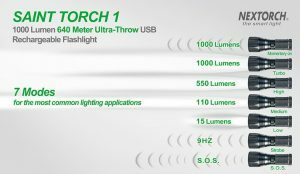 You can also charge Saint Torch 1 from your house plugs with the supplied cables. The beam is bright a reaches far. It is also not a narrow beam and you can get quite a lot of coverage with the beam. The LED lights tell you how much battery you have left in the charge and you can run this on just 1 battery (we got it to hit 640 lumens if I remember correctly) on just 1 battery. SO if you are charging 3 or splitting batteries between torches you can still use this bad boy. The button operation is quite simple. Press in half for momentary on. Push in a full click for permanent on: now you can start to select different lighting options. If you want to use less Lumens (in a building for instance) start to use half presses and each press will reduce the brightness until you hit the strobe function. If you want S.O.S then press the button in once. And then press it half way and hold for 3 seconds until the S.O.S functions starts. Easy! 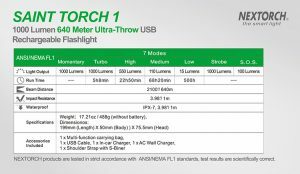 The Nextorch Saint 1 also comes with its own handy carry bag. The bag has multiple straps for just about ever carry purpose. 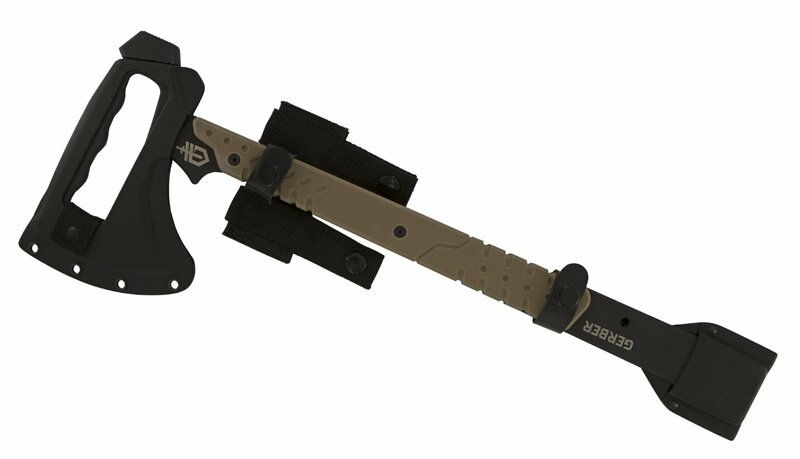 These include the ability to carry it over the shoulder, around the waist, attached to a bag or webbing, carry as a hand bag and pretty much any other carry function you could reasonably need. The cords for the 2 different chasing options are also stored in the bag so it all comes along for the ride. The Saint Torch 1 is an ultra-throw outdoor searching flashlight, using a single CREE® XM-L2 U2 LED, delivering up to 1000 lumens. The reflector is super-powered, letting its beam extend as far as 640 meters, allowing your search light to go further. Mag LED 3Rd Gen 2D 366m &..